The Take Control Back To School Sale Is On! Take Control is here to support you! So through August 24th, you can add any number of our books to your Take Control library for 50% off the cover price. All our books are DRM-free and available in PDF, EPUB, and Mobipocket (Kindle) formats, so you can read wherever, whenever, and on whatever device you like. Use this link to pick the titles you need to stay up to date: http://tid.bl.it/50-percent-off-back-to-school-sale-2015 (We expect everything to work properly, but if our newly redesigned site is overloaded by sale traffic, try again later in the day when things have settled down.) Remember, there’s no need to read a Take Control title from front to back; instead, each book has a Quick Start that helps you jump instantly to the information you need. We have books that will help with numerous Apple-related technology tasks and projects, including: * Converting from iPhoto to Photos * Figuring out what the heck iTunes 12 is up to * Maintaining an AirPort-based Wi-Fi network * Installing and running OS X Server * Syncing and sharing files with Dropbox * Enjoying your Apple Watch For those new to Take Control and looking for a quick fix, we have a few instant-purchase bundles, also 50% off: * iWork explained: Apple’s iWork suite — Pages, Numbers, and Keynote — now comes free with every new Mac, and offers a level of power that compares well with the heavyweight Microsoft Office. The three books in our iWork trilogy provide 750 pages of comprehensive documentation. Normally the three books would cost $55, but for this week, they’re only $27.50 — perfect for college papers and projects. http://tid.bl.it/50-percent-off-iwork-bundle * Automation for everyone: Macs have fabulous time-saving tools that can turn anyone into a power user. This bundle of “Take Control of Automating Your Mac,” “Take Control of LaunchBar,” “Take Control of TextExpander,” and “Take Control of the Mac Command Line with Terminal” would normally cost $50, but is only $25 in the sale. http://tid.bl.it/50-percent-off-automation-bundle * Safe computing: Today’s Internet is unfortunately an insecure place, with hackers, malware, and bots threatening your privacy and security. With calm, friendly advice, Joe Kissell explains how you can stay safe in “Take Control of Security for Mac Users,” “Take Control of Your Online Privacy,” “Take Control of Your Passwords,” and “Take Control of FileVault.” Together they’re normally $50, but if you’ve been meaning to lock down your Mac and improve your passwords, you can now pick them up for only $25. 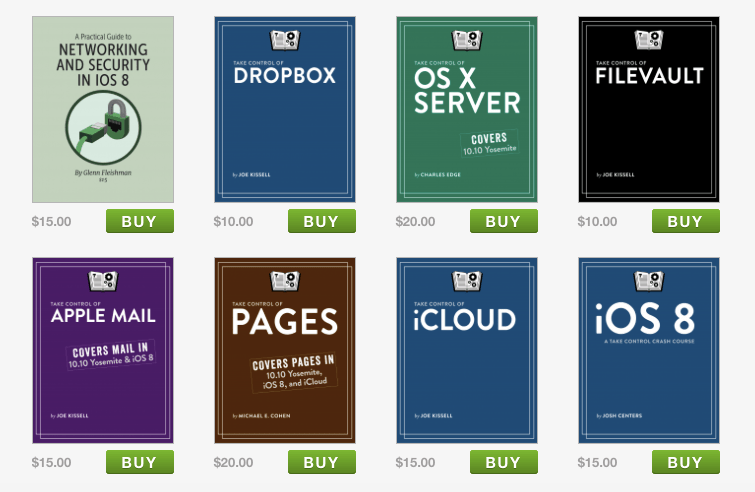 http://tid.bl.it/50-percent-off-security-bundle We also have books about Yosemite, iOS 8, Apple Mail, iCloud, Audio Hijack, PDFpen, Scrivener, DEVONthink, Apple TV, and more. So stock your Take Control library today with the titles that you’ve been wanting to read or that might be useful in the future! http://tid.bl.it/50-percent-off-back-to-school-sale-2015 Thanks so much for your continued support, and the many useful questions and kind comments you’ve sent over the years. Please do us a quick favor, and spread the word about this sale to your friends and colleagues — it’s the perfect way to introduce someone to the series or to get your mother to switch over to using Photos.